-Longer use time,A-ZONE security solar motion lights can last to 40 hours after full charge at weak light mode. -Shorter charging time, Normally it can be fully charged in 4 hours under very bright sunlight. -High-quality aluminum alloy shell solid durable and more safely. -800LM LED solar powered flood light make the place around you more brighter. 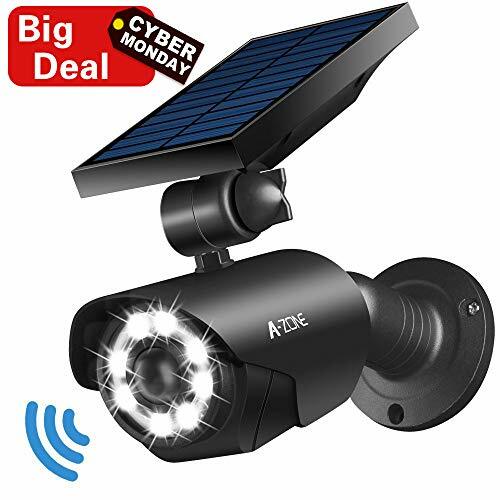 -Solar lights can be adjustable for 360 degrees, and the solar panel is also with adjusted angles, therefore you can get full range of lighting and sensing angle. 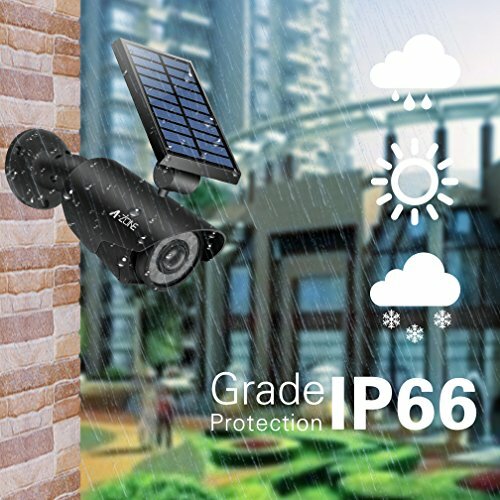 -Build-in PIR Motion Detection Sensor, it can detect up to 10-26ft away, range 120 degree. -Please install the Solar Flood Light face south and make sure the solar panel can get the good sunlight. If there is no good sunlight or in bad weather, it may take longer time to be fully charged.Normally it can be full charged in 4 hours under good bright sunlight. -Please don't fold the solar panel hard and frequently. -The battery may power down without good sunlight in one month, so you have to recharge it at bright sunlight day. -Rechargeable 18650 lithium battery is a consumable, you can replace the it after 80-100 weeks. 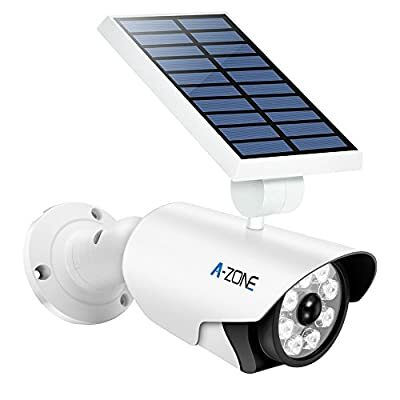 ?Super Bright AZONE Solar Powered Security Light with Longer Use Time?-800LM 5W(110W Equiv. )LED outdoor solar flood light with PC lens makes it much brighter. Battery capacity of 2600mAh,only takes about 4 hours to fully charge On sunny days. last to 40 hours after full charge at weak light mode, which is much longer than other similar products in the market. 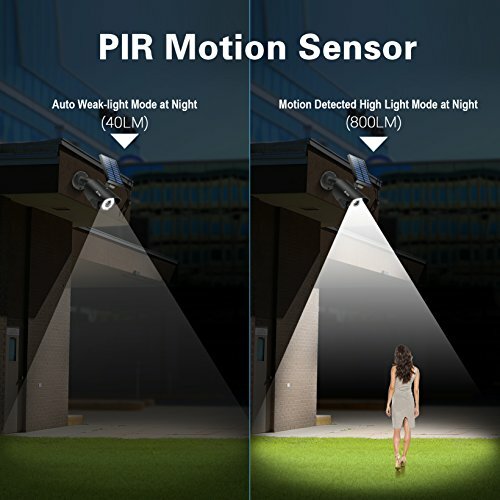 ?Optics-grade Fresnel Lens on PIR Motion Sensor Light?-Build-in PIR Motion Detection Sensor, this solar lights can detect up to 10-26ft away, range 120 degree, bright mode(1400LM) turn on for 15-20s after the motion detected, then turn to weak light mode automatically to save power. ?High Quality Aluminum alloy + ABS Material?- High quality aluminum-alloy case. 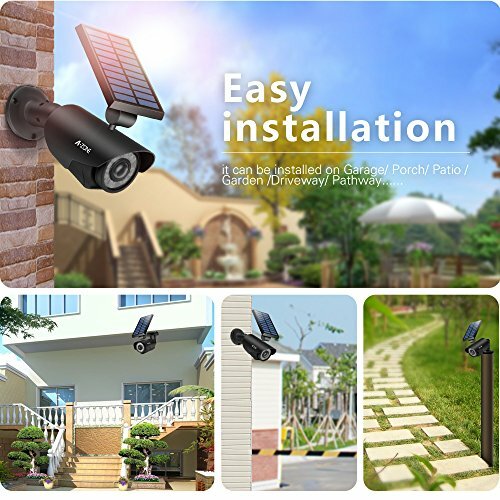 Solar lights using Constant Current&Steady Voltage circuit board, Charge&Discharge protect IC and Replaceable Li-ion battery design(3.7V 2600mAh), making it more secure.IP66 Waterproof.Perfect for Porch Garden Patio Driveway Pathway. ?Two Working Mode?-To Save Energy,Solar Lights outdoor has built-in photocell sensor, it will turn off during the daytime. And it will turn on weak light mode at night automatically, when people get close around 10-26ft, it will switch to high light mode. 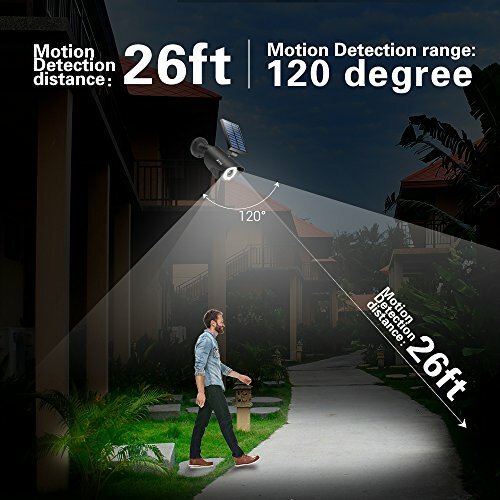 ?360°Adjustable ?- Solar Motion Sensor Light Outdoor Holder Can be Rotated 360°, and the Solar Panel is also with adjusted angles, so you can get full range of lighting.Please install the Solar Lights face south and make sure the Solar panel can get good sunlight.